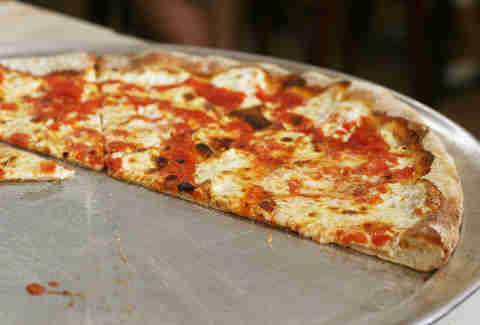 As an NYC native, I was baptized into the church of Almighty Pizza at a young age -- and even though nobody explicitly told me, I knew the only way to worship this glory was with my hands. Plenty of celebrities have gotten flak over the years for taking a knife and fork to their pizza (most recently presidential also-ran John Kasich), and I've always been more than happy to wade into the fray as a Real New Yorker™, blasting these people for their shameful pizza conduct. But last month, I had a crisis of faith: I used the knife-and-fork pizza method at a sit-down dinner with my girlfriend, and it was good. Great, even. 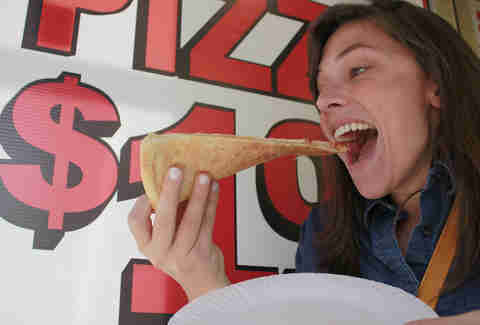 Turns out I was totally wrong, and everyone should start eating their pizza this way. Seriously. Please, save your boos until the end and hear me out. 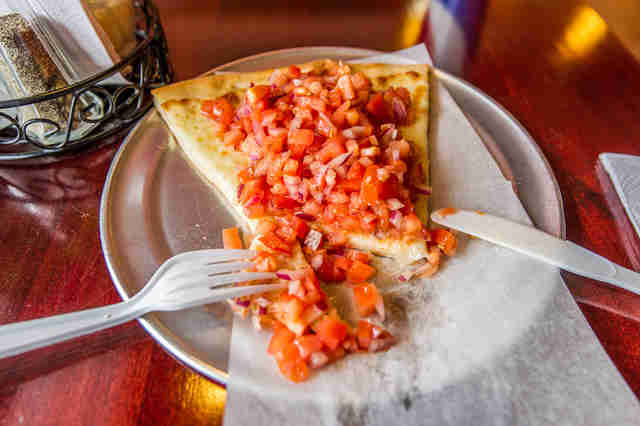 The NYC instinct to grab a slice, fold it, and chomp away is partly based in necessity: everything's fast-paced here, and if you're buying a single slice at a $1 pizza joint, you're gonna want to take it on the run. Even the local fauna is down with the grab-and-go mentality. 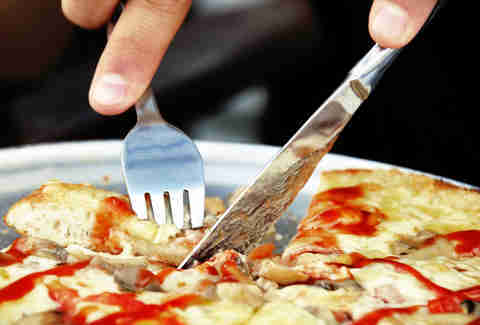 By contrast, using a knife and fork slows the whole process down and forces you to focus a bit more on the pizza itself. Each bite becomes more deliberate, allowing you to appreciate more subtle flavors than you otherwise might if you just folded the slice into a pizza sandwich -- and while that sounds like the best sandwich ever, it's completely beside the point. Another added bonus is, instead of inhaling half a pie in 10 minutes, you might find yourself feeling full halfway through your second slice. 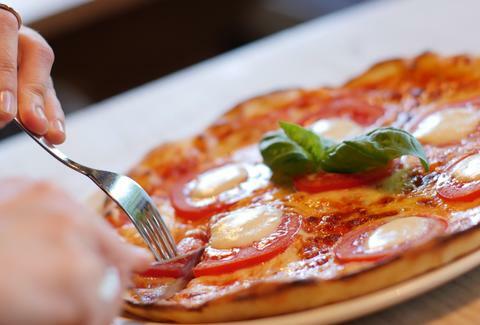 Advocating for eating less pizza isn't something I ever thought I'd do, and I feel dirty even suggesting it, but let's be honest: the goal of eating pizza isn't to eat a TON of pizza, it's to eat pizza till you're satisfied. The difference can be subtle, but it's there. There are practical reasons to use a knife and fork, too. If you've gone topping-mad, a slice can become nigh impossible to eat with your hands, making cutlery a necessity (unless you like pulling chunks of tomato and sausage from your shirt). Also, hot pizza grease has an unfortunate tendency to run everywhere and ruin everything in its path -- unless you're using a fork, in which case you can contain the flow and ensure every part of the pizza ends up right where it belongs: in your greedy gullet. Now, let me be perfectly clear: I'm not saying you should ALWAYS eat pizza with a knife and fork. If you're eating a single slice, using a knife and fork is just silly, and asking the guy behind the counter for some cutlery is a good way to get banned for life. Likewise, if you're at a party and someone orders pizza, you should go with the crowd and handle that slice with your bare mitts. If, however, you're at a restaurant with a few other people, and you've ordered a whole pie that arrives at the table on a metal tray, hot and fresh from a brick oven imported from the old country, you owe it to yourself to try using the knife and fork that were there when you sat down. Sure, you might get some awkward looks from your fellow diners, but you'll be too busy appreciating the hell out of your pizza on a whole new level to care. You'll finish the meal with a renewed purpose, and a desire to change the world -- or, you'll say, "that was stupid" and never eat pizza with a fork again. Either way, you'll have eaten the best food in the world, so what does it matter? Gianni Jaccoma is an editor for Thrillist, and he's sorry for ever doubting the fork/pizza combo. Tell him how wrong/stupid he is on Twitter: @gjaccoma.